Over the weekend, I stumbled across an interesting tweet from @asymco regarding a new iPad app called ColoRotate. 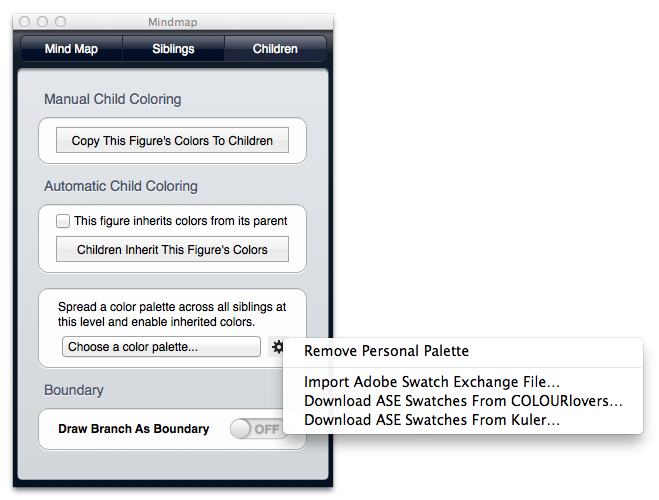 It allows you to create beautiful palettes of colors either manually or from an image. Colors that make sense. Fast and intuitive 3D color editing for pros and enthusiasts. The ColoRotate app for iPad is an intersection of art and science. Unleash your creativity for any design project. Create color themes with up to 15 colors. Many ways to share. You can edit colors in 3-D, extract from an image, blend colors together, precisely edit in different color spaces, or generate harmonized color palettes using color theory. ColoRotate also has a web version of their app which you can try out here. The best part is your palette can be downloaded as an Adobe Swatch Exchange (.ase) file which can then be imported into Curio and spread across mind maps. Very cool! This is also the first time I've seen an ASE file with more than 5 colors which is the usual size of a palette when coming from other popular color sites such as Adobe Kuler and ColourLovers. I've imported palettes from ColoRotate with over a dozen colors and it works perfectly in Curio. Nice!